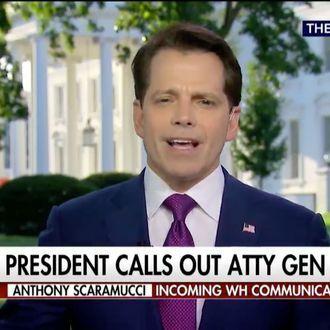 Anthony Scaramucci, Donald Trump’s latest fair-haired boy, appeared on Fox & Friends, where he was asked an actual journalism question: Does President Trump want a new attorney general? Trump has confusingly subjected his incumbent attorney general to a stream of abuse, but has failed either to fire him or ask for his resignation. Scaramucci seems to be playing the “Trump just blurted out something offensive” answer tape for a “why won’t Trump say his position” question. And so his official line is that Trump’s so direct and honest that he won’t say whether he wants to retain his attorney general.